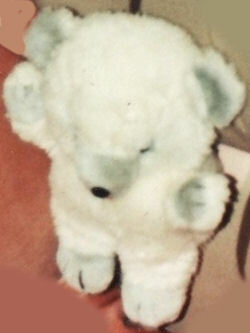 I am looking for a white polar bear about 8 inches tall, that had a red tongue and came with a silver ribbon around his neck. My Polar was very much loved by me as a young child in the late 80’s. He even accompanied me on a very long trip around the southern US but was somehow lost during a move in 1991 and has been missed and longed for ever since (yes, 20+ years later). My only hint to the maker is Commonwealth, because I purchased a smaller bear that looks similar on eBay. Thus Commonwealth is a possibility but not a given. I’m really hoping to find a replacement to fill the void.